Don’t get me wrong. I’m super excited to be pregnant and at this rate, in officially my eleventh week of gestation. Eleven weeks. When they did my ultrasound, they said the baby was already fully formed. That happens at eight weeks. They said now, the baby just has to grow. I was fascinated. Finding out I was pregnant was full of mixed emotions. Didn’t I just have a few glasses of wine the other night? I thought to myself. Have my blood sugars been decent? Is this OK? And by OK, I was thinking about my health but also, what were my parents going to think. Then I realized I was married and all was right with the world! I sometimes still think I’m a teenager, living a dream. When I found out, I didn’t want to tell anyone except the women closest to me. My sister came over, full of excitement. My husband and I not knowing what to make of this. I was already 13 days late and started texting my sister in the afternoon telling her that something must be wrong with me. Cancer. A huge cyst. “Can you just be pregnant? That would make all this a lot easier.” Pregnant? Could I be? See, since I was 18, NO! Before that! Since I saw Steel Magnolias (a terrible movie to learn about diabetes by the way), I thought, there’s no way. There was no way that I could make it through child birth alive if Julia Roberts couldn’t do it. Welp! My A1c before getting pregnant was a 7.7. That number kept repeating in my head. I was scared. So I turned to a friend who I’ve known for a while long-distance, but whom I trusted because she too is insulin dependent and had a daughter while having diabetes. I’m lucky that I have people to turn to. My sister bought me books. Those week-to-week books and how to be natural and healthy. And of course “What to expect when you’re expecting,” the bible to all expecting mothers. I’ve eaten some great recipes, my husband has been trying new recipes and listening to the foods I should be eating to make sure my baby has the nutrients it needs. On the upside, both my gynecologist and endo say that I’m doing fine. Right before I found out I was pregnant (sweet coincidence or…) I was put on the new MiniMed 670G– the pump that goes into auto-mode, adjusting your basal rates according to your CGMS and giving the appropriate dosages. Since I started using it, I’ve been in range, which what I believe is still a bit higher than where they want you when you’re pregnant, 75 percent of the time. However, this is better than I used to be and my endocrinologist said that with just these few changes, I’ll be bringing my A1c down to a good and healthy range. Needless to say, I’m not longer scared like I used to be. I’m eating well, feeling amazing and don’t have any of the awful symptoms I always hear about. I’m still afraid that something could happen, but what expectant mother hasn’t felt that way? The other amazing thing that I’ve seen is my friends and people in the diabetes online community who have diabetes going through successful and healthy pregnancies. That gives me so much hope. Even though I’ve known moms to have gestational diabetes during their pregnancies, it’s not the same. I know that there are some relational elements, but in the back of my head, I’ve always thought, “Is my body healthy enough, prepared enough, not too far damaged, to have a baby?” It’s awful– I told you Steel Magnolias did nothing but make me worry. 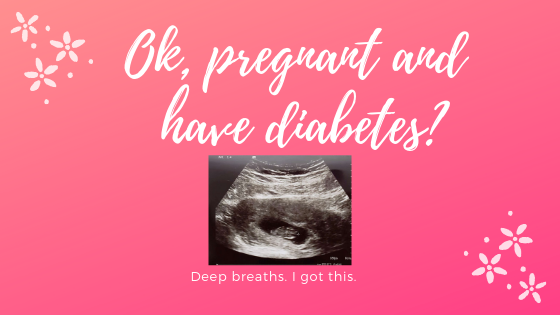 But really, you hear about instances where it just wasn’t meant to happen and they say that because of “uncontrolled” or high blood sugars, miscarriages are common among women living with Type 1. So you see, it’s a little different and, dare I say it, more traumatic even considering having life within your semi-broken body. I speak for myself however. I don’t know how other moms living with Type 1 have ever felt. Needless to say — I pray that everything is going well. I think nothing but positive thoughts and the fact that my dog loves me extra right now, helps in that special feeling. I’m sure I’ll be writing more about this as time goes on, regardless of what happens. From here on out, here’s to love, good food and healthy baby! Thank you!! Yes, I can! ❤ Thank you for the encouragement. Always look up to the DOC mommas!